Eating our way through Peru’s capital. 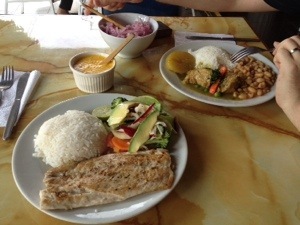 Lima is renouned for being a ‘foodies dream.’ After only two short days in the capital of Peru, we can see why. From restaurants to street carts, from cevicherias to cafés – freshness and flavor are king in this part of the world. We spent two days exploring the main sights. We checked out colonial architecture, cathedrals and catacombs in Central Lima. We wandered around the trendy and upscale neighborhood of Miaflores. We ended our stay overlooking the sea in bohemian Barranco. We pretty much did it all, letting our stomachs guide us the entire way. It all started with street food. First up, a leaf wrapped quinoa-chicken mixture purchased from a pair of nuns standing outside of a cathedral. After that, anticucho – beef hearts grilled on a stick and served with boiled potatoes. Perhaps the most delicious was the creme caramel. Served on the street, it was better than what you’d get in most restaurants. We didn’t just eat street food on this trip (though we probably could have.) Our first meal was arrozo con mariscos, a simple but flavorful rice dish prepared with the freshest seafood mixture – quite similar to paella. Another notable find was a restaurant dedicated exclusively to the aforementioned beef heart skewers. We ordered ours with a hearty side of stomach and gizzards. Most impressive was the seafood: everything straight from the ocean, prepared using the lightest and freshest flavors. Citrus and fruity seasonings, everything served with a side of fresh red onion salad. This is the land of ceviche, the citrus marinated seafood delicacy. There are also plenty of drinks to sample. Pisco is a grape-based brandy; combine it with an egg-white mixture and some lime juice, you have yourself a Pisco Sour. This drink is standard on every menu here, we tried our first at the place where it was (allegedly) first invented. All of this deliciousness has made us change our travel plans. We’ll be skipping the relaxing Lake Titicaca, for a visit to Arequipa where it’s rumored that we can take cooking classes.